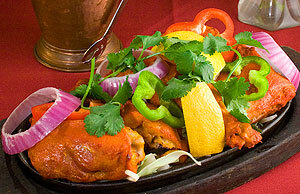 All dishes are cooked on charcoal fire in clay pot and served on sizzling platter. Chicken marinated in yogurt, ginger and garlic, then roasted in our clay oven. 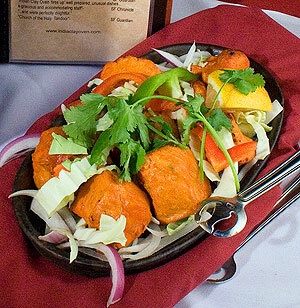 Boneless cubed breast of chicken, marinated and roasted in our clay oven. Succulent cubed leg of lamb, marinated and roasted in the clay oven. 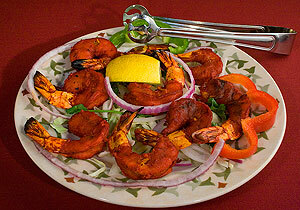 Jumbo prawns marinated in yogurt & spices then roasted in the clay oven. 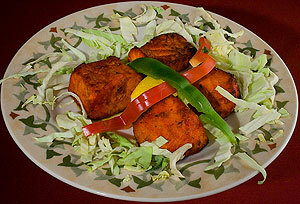 Fish marinated in special spices and herbs cooked on skewers. 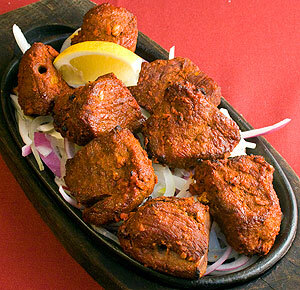 Minced leg of lamb mixed with herbs and spices, then dry cooked on skewers. 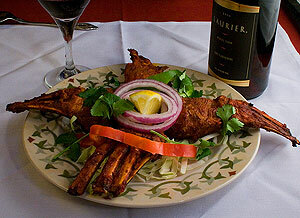 Free Range, Natural rack of lamb marinated in Clay Oven�s signature recipe of yogurt Indian Spices.